A fresh approach to clean water – vending machines. Note from Michael: the following information was provided by the merchant. Attentiongreen businesses, do you have a special coupon or discount offeryou’d like showcased on Green Living Tips? Learnmore here. Both bottled water companies and municipal water systems have come under fire in recent years. The former because of the huge burden the manufacture, distribution and disposal of single use plastic bottles puts on our local communities, landscapes; in fact every ocean on the planet. Many environmentalists advocate we simply return to the tap for our drinking water. The problem? Evidence is mounting daily that a vast array of man-made chemicals in the form of industrial solvents, pesticides and pharmaceuticals are percolating through our watershed and back into our commercial drinking water sources, having the potential to create undetermined long term health hazards. Despite the environmental negatives of throw away plastic, many still opt for commercially bottled water as the”safer” alternative. While home filtration systems are a great idea, what about when you’re out andabout and your supplies have run dry? Aqua Star International has developed a new type of water vending machine that now gives the eco-conscious consumeron-the-go an alternative choice between plastic or the tap. The new machines dispense high quality chilled water into theuser’s own bottle. The machines are designed for high traffic retail, campus and recreational settings; indoors or out. Realizing old habits die hard, Aqua Star International has joined forces with Cynergreen, a leading manufacturer of stainless steel water bottles to create marketing promotions designed to encourage use amongst the community surrounding the locations of these water stations. Early interest has come from a varied audience; from transit authorities and parks to upscale resort properties. In fact, the very first installation of “b.y.o.b.” (bring your own bottle) machines has had a major impact. Six machines were installed at transfer stations of a public bus transit system. Installed for the needs of the 500 bus drivers in the system, the transit company has eliminated the use of over 200,000 plastic water bottles in just seven months. If interested in owning and operating b.y.o.b. water vending machines or getting them placed in your community, please contact rick@aquastarintl.com for moreinformation and be sure to mention Green Living Tips. As a special offer to readers of Green Living Tips, we are offering an exclusive 15% discount off our standard pricing for purchases or a free gift basket of sustainable products for leads that result in placement of machines in your community. 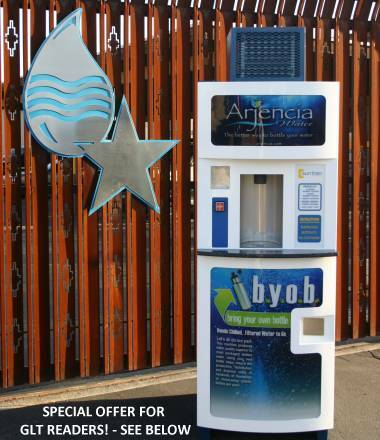 Learn more about our water vending machines at Aqua Star International.For further details about the discount and gift basket offer, contact Rick MacNealvia rick@aquastarintl.com (mentionGreen Living Tips).